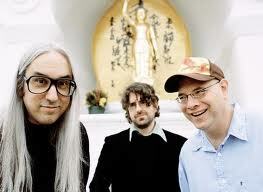 "Dinosaur Jr? More like Dinosaur Sr!" Although it does little more than raise a smirk, this would-be witty remark I overheard at a recent Dinosaur Jr concert did spark something in my mind. They've been around a long time, haven’t they? A really, really long time. It prompted me to scan the room, to which I noticed balding gents aplenty, most of whom probably had J. Mascis length hair the last time they saw them play nigh on 20 years ago. The age of the crowd was so diverse and the people so varied it felt every bit a privilege to be in the presence of a band that had touched two generations of listeners. Entering the stage with a trademark sense of ambivalence, J. Mascis and company plugged in their guitars, shuffled their seats and tuned their instruments by hand. Their blasé entrance however was the very antithesis of their live vivacity, as Lou Barlow in particular exuded the energy associated with their 1982 punk band Deep Wound. “See It On Your Side,” the final track from their newest album probably wasn't the perfect choice for an opener; nor was it what the crowd expected, but the mere presence of the band and the tight execution was enough to elicit a big reaction. Their newest release I Bet on Sky was featured heavily, as was their classic 1987 release You’re Living All Over Me. Fan favourite Bug was largely ignored due to the bad memories and former band split associated with it, and aside from I Bet on Sky and You’re Living All Over Me, a scatter-gun selection of tracks from their discography and a cover of The Cure's "Just Like Heaven" comprised the set. Bug may be J. Mascis’ least favourite Dinosaur Jr album, but “Freak Scene” was an unsurprising set highlight and it brought with it not only the greatest reaction from the crowd but a loss of sense of self among many. The balding 40-somethings may no longer have had shoulder length locks, but when the opening notes sounded you wouldn't have known it as they instantly recalled their younger selves and head-banged and moshed accordingly. This yet again conjured the notion of age and longevity, but the salient point is that Dinosaur Jr’s music is as fresh now as the day it was released, not only evidenced by the string of successful releases in the past 5 years but by the way it transfers to stage and transcends generations. Here’s to 10 more years.